There are about as many exercise goals and reasons for working out as there are individual people so how you go about getting started is entirely up to you! Set a Goal...you've gotta have goals, right? Be specific. "Lose weight" is NOT specific. "Lose 20 pounds in four months" IS specific. See the difference? Be realistic. "Lose 20 pounds by next weekend", definitely NOT realistic. Be honest and smart about your current habits. If you're a couch potato right now then running 3 miles 6 days a week is not a realistic goal to start with. It's a goal to work towards but not to start with. Be progressive. Set shorter goals to get you there. If "Lose 20 pounds in four months" is your goal then what are you going to do this week to move towards that goal? Break a long-term goal into short 1-2 week goals. This helps you have success along the way to keep you motivated. Ok, decided on your goal? Click here for a printable Fitness Goals chart! 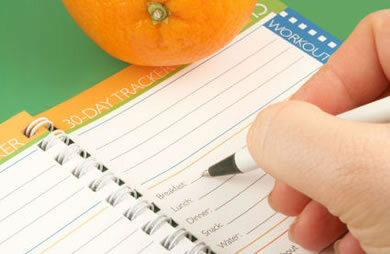 Studies show that having goals written down helps keep you on-track, motivated and accountable. Sharing your goal with your spouse or a trusted friend also keeps you accountable. Hopefully, the person you choose to share with will be encouraging and motivating for you! You have your goal. Now how are you going to reach it? Here's where the plan comes in. Some combination of cardiovascular exercise and strength training is the best way to reach almost any fitness goal. You can plan your workout routine a week at a time, a month at a time or any length of time that works for you. Your plan does not have to be super-detailed unless you want it to be but having some idea of what you're going to do in advance saves you time and will make your workout more productive and effective. Think about the amount of time you will have on any given day and what equipment you will need or already have for exercise. If you plan to purchase some new gadgets don't wait until then to get started. You can still do some exercise between now and your shopping trip! Unless you are certain you can workout at the same time every time, look at your calendar and be realistic. Will you really have time to exercise on a day you have a big work deadline or the kids soccer tournament? But don't wait for the stars to be perfectly aligned...just do something! Just like your goal, write your plan down. Your plan is not written in stone (or maybe that IS where you wrote it!) so give yourself a break if your schedule changes or you just don't feel like exercising one day. It happens to all of us, trust me! Adjust your plan and keep going. Make sure you have rest days! Don't get crazy. If you're new to exercise (or returning after a leave of absense!) ease into it. Plan workouts that last about 20 minutes in the first week and work up from there. Do cardiovascular exercise and strength training on separate days to start. You'll also need rest days where you do no exercise at all. This is really important...don't skip rest! Again, look at your calendar and plan these days. Having a dedicated workout space is not essential but it certainly helps! At the very least, a cardboard box in the corner to keep your equipment in is a start! While some people may be blessed with an entire room available to dedicate to exercise, most of us are probably not that lucky. Make sure there is enough cleared space for your particular workout routine to take place. You don't want to be banging into the end table or knocking over lamps! Keep any equipment you will use together in one place. If you have to run all over the house to complete different parts of your workout, will it really get done? Keep your equipment as easily accessible as possible. Obviously, you don't want to keep your dumbbells on the dining room table but don't store them in a box in the back of the closet with three other boxes stacked on top either! No equipment is really necessary to get a good workout but at an absolute minimum, you'll want a large towel or exercise mat. You don't want to lay on the carpet or hardwood floor when you're all sweaty.